The final episode of Call the Midwife attracted 9.2 million viewers, according to initial overnight figures. The BBC said it was the most successful new drama series on the channel since 2001, when the current ratings system began. 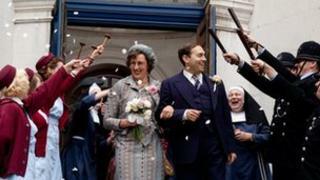 The series finale saw the wedding of popular midwife Chummy - played by Miranda Hart - and policeman PC Noakes. Written by Heidi Thomas, the series was adapted from the real-life memoirs of the late Jennifer Worth. Her books recalled her work and life in the East End of London as a midwife in the 1950s. BBC One controller Danny Cohen said: "It's been wonderful to see viewers respond so warmly - and in such large numbers - to this world of babies, nuns and extraordinary women." A second series has already been commissioned and will return to the BBC next year. Thomas said: "When Jennifer Worth was dying, I took her hands in mine and promised I'd do everything in my power to make her books sing as a drama. "She will be looking down now from the heaven she undoubtedly believed in, and smiling. That means more than I can say." Last night, Call the Midwife was moved half an hour later than usual to avoid clashing with Coronation Street on ITV1, which was moved from its mid-week slot due to a Uefa Europa League football match. Coronation Street was seen by an average audience of 8.6 million viewers, while Upstair Downstairs - which returned for a new series on BBC One straight after Call The Midwife - attracted 6.5 million people.